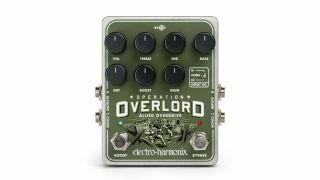 NAMM 2017: Hot on the heels of The Blurst, US effects firm Electro-Harmonix has debuted another new pedal - a multi-instrument-capable overdrive/distortion, dubbed Operation Overlord. The new pedal works with guitar, bass, keys and a variety of other electronic noise-makers, and uses JFET gain stages to create valve-y distortion tones. Engaging the Boost circuit then adds an overdrive ahead of the gain stage. Controls include treble, mid and bass EQ tweaking and a Dry Blend, while dual inputs and outputs allow a variety of applications for the multi-instrumentalist. Current US MSRP is $197. WINTER NAMM, Anaheim, California, January 19, 2017: EHX introduces the Operation Overlord, a versatile, multi-instrument capable, stereo distortion/overdrive with a broad range of sound options and controls. Fully stereo capable, the pedal is equipped with left and right ¼" input and output jacks.